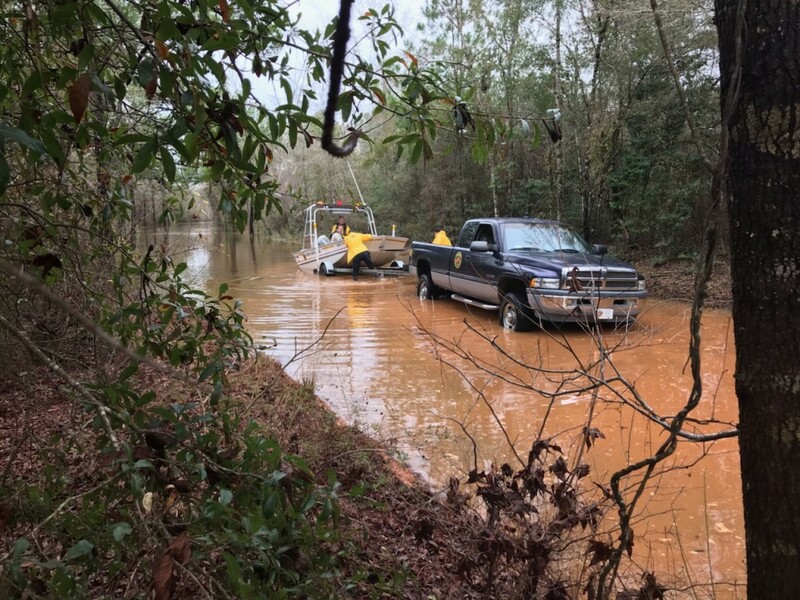 A camper from out of state found himself surrounded by flood waters near the Bluff Springs Recreational Area on the shores of Escambia River. There was a collaborative effort by members of the Escambia County Sheriff's Office, the Florida Fish and Wildlife Conservation Commission, and Escambia Search And Rescue to launch an ESAR vessel on the flooded roadway to gain access to where he was camping, in order to help him back to safety. ESAR has a new Director! ESAR Marine Operations Commander BJ Dunson has been promoted to the position of Director. In his younger years, he enlisted in the US Coast Guard in 1972 and served for 26 years, retiring as a CWO3 (Naval Engineer). While in the Coast Guard he was employed as a Maritime Law Enforcement Officer, Lead Boarding Officer, Engineering Officer and Officer of the Deck for two (2) 82 Ft and one (1) 110 Ft patrol boats. He was a Search and Rescue Coxswain for 18', 21', 23', 30', 40', 41', and 55' Rescue/Work Boats. His last duty station was in Mobile serving as a Marine Investigator and Marine inspector for commercial vessels. He was once assigned to the regional Incident command center and retired as the Chief of Small Passenger Vessel Section. While in the US Coast Guard, he was decorated for several search & rescue and law enforcement missions. BJ holds an associates degree in Industrial Management Technology from Pensacola State College, and was a member of the State of Florida Medical Reserve Corp for two (2) years Prior to joining ESAR. BJ has served as ESAR's Marine Operations Commander, and is Certified through the National Association for Search And Rescue (NASAR) Search And Rescue Technician II (SAR Tech II). He is also a graduate of NASAR's Urban Search Management course. All of ESAR is 100% volunteer, we call ESAR our "unpaid job". For his "bill paying job" he is the owner of Dunson Marine Services LLC, a marine surveying and safety consulting company. You Can Support ESAR While You Shop! Wrap-up your holiday shopping at smile.amazon.com/ch/59-1813182 and Amazon donates to Escambia Search And Rescue Inc.
On Tuesday, December 5th, at about 6:20pm ESAR volunteers responded to a report of a missing elderly male with Dementia who had walked away from family at the Red Lobster on 9th Ave. This is a heavily congested area, with many locations that would have been a nightmare to search, sort of a needle in a haystack type situation. He could have been inside any number of stores in Cordova Mall, any area of Sacred Heart Hospital, or parking garages, etc... Thankfully, he was enrolled in Project Lifesaver!!! An ESAR Project Lifesaver Electronic Search Specialist was able to pick up the signal as he was driving into the area. The missing person had crossed two very busy roadways, and was found near the McDonald's on Airport Blvd, near the Sam's Club. He was recovered within minutes, and returned to his family without incident. This is the 4th Project Lifesaver rescue within a couple of months. If you know of anyone with a wandering condition (Autism, Alzheimer's, Dementia, Traumatic Brain Injury, or related), please have them enroll with Project Lifesaver. The all-volunteer members of Escambia Search And Rescue are often called away from home, family events, work, and so on, to help others. Occasionally we need help ourselves. This is a true life story that happened to a member of Escambia Search And Rescue on Thanksgiving Thursday, 2017. Imagine that you’re a single mom, busy cooking dinner on Thanksgiving. Now imagine that for the last few minutes, you realize that you have not heard or seen one of your sons, who has Autism. You ask your other son where his brother is, and he says “I don’t’ know, he got mad and ran off”. A bolt of fear flies through you as you grab your keys and jump in the car. Pulling off of your street, you see your son running down the road at a full run. As he turns onto a side street that you know is a dead end, you think, “Well good, at least this is a dead end road, he has nowhere to go”. As you turn onto that dead end road, your fears fly back as you see him dart into the wooded area at the end of the road. The wooded area at the end of this road is made up of swamp and woods that cover about 25 square miles, and he was at a dead run as he left the roadway. This type of situation occurs often all across the country. Sometimes there is a happy reunion; sometimes there is a tragic ending. Fortunately, this story does not end in tragedy thanks to a program called Project Lifesaver. Project Lifesaver is a program for people who have a cognitive condition that may lead to wandering, and not being able to find their way home, or be safe (such as Autism, Dementia, Alzheimer’s, Traumatic Brain Injury, etc.). They wear a small radio transmitter that constantly emits a radio signal that can be picked up by receivers that ESAR has distributed with certified Electronic Search Specialists around Escambia and Santa Rosa counties. The mom in the above scenario is a member of Escambia Search And Rescue, and is a certified Electronic Search Specialist. She yells for her mom to call ESAR as she grabs her Project Lifesaver receiver and hits the woods. Turning on the receiver, she immediately gets a beeping chirp, which tells her which way to go to her son. As he changes direction time and time again, Project Lifesaver keeps telling mom which way to go, until she closes in on him about 75 yards deep in this thickly wooded, vine-choked area, and they both safely return home. This situation was over in minutes, but without Project Lifesaver, this could have very easily turned into a multi-day search, involving hundreds of volunteers, and a multitude of public safety agencies. That is just one of the values of Project Lifesaver. You can figure up the value of volunteer man hours; you can figure up the value of public safety resources (law enforcement, fire, ems, air support, etc.). What you cannot put a value on is safely recovering a vulnerable child and bringing them home within minutes. If you would like to know more about Project Lifesaver, please email Director@ESAR.com. Good Couple of Months for Project Lifesaver! On October 02, in the middle of the day, an elderly female with Alzheimer's wandered away from her caregiver in a thickly congested commercial shopping area near Cordova Mall. Fortunately, she was enrolled in Project Lifesaver, a LOCATING TECHNOLOGY in which ESAR is heavily involved. ESAR volunteers quickly moved into the area and searched until picking up the radio signal from the transmitter worn by the missing female. We were able to locate her, while she was wandering aimlessly around a large apartment complex. She had fallen, and scraped her leg and forehead but was otherwise OK. Total time from initial phone call from the caregiver to safely recovering the missing person was ONLY 22 MINUTES! On November 12th, after darkness had settled in, an elderly male with dementia wandered away from his caregivers in another busy commercial shopping area off of Davis Hwy. Also, fortunately for him, he was enrolled in Project Lifesaver. ESAR volunteers responded to the area. His signal was picked up, and he was located about a mile away from where he was last seen. His radio transmitter led searchers directly to him inside another big store. He was not walking around outside, so would have been very hard to locate without all of the time and effort it would take to go into, and search the entire floor of every store and restaurant in the area. Total time from initial phone call from the caregiver to safely recovering the missing person was ONLY 31 MINUTES! A quick google search for "Missing Alzheimer's" or "Missing Autism" will bring up a multitude of news stories from around the country. Some involve days of searching and hundreds of man hours, yet still end with the death or injury of a loved one. This is why ESAR is so heavily involved in Project Lifesaver. On Saturday, April 16th, 2016, members of ESAR's Marine Ops Command and Dive Command were instrumental in locating a drowning victim utilizing side imaging sonar in the Intercoastal Waterway in the area of Fort McRee. ESAR Marine 1800 first located the victim, and confirmation was made by ESAR members aboard a Florida Fish and Wildlife vessel. Escambia County Sheriff's Office Dive Team was on scene and recovered the victim. ESAR members on scene reported that multiple agencies worked very well together during the search and recovery effort: US Coast Guard; Florida FWC; Escambia County Sheriff's Office; US Navy; Escambia Fire Rescue; and other good Samaritans participated in the search. ESAR Marine Operations stayed pretty busy last week. Marine Ops Members attended a meet and greet at Mission Fishin' Angler's Night. Then, all the following week, they provided boats for the on the water Human Remain Detection K9's attending the NNOCDS K9 Seminar from all across the country. Next, Marine Ops had a boat in the water for the Kid's Fishing Clinic, assisted by a Rescue Swimmer from Dive Command, and members from other Commands keeping a watchful eye along the railing in case someone fell into the water. And finally, as I type this, Marine Ops members are out on a mission. With our proximity to water (rivers, bays, etc...), Marine Ops is generally one of our busier Commands, but this has been a busier than normal week. Many thanks to the Marine Operations members and those from other Commands who support them.